Plain and simple, the Big Island has some of the best snorkeling in the Hawaiian Islands—and in the entire world. Everything is more beautiful in Hawaii and the fish are no exceptions. The wrasse, the yellow tang, and the parrot fish are all vivid in color and unlike fish you have seen elsewhere. 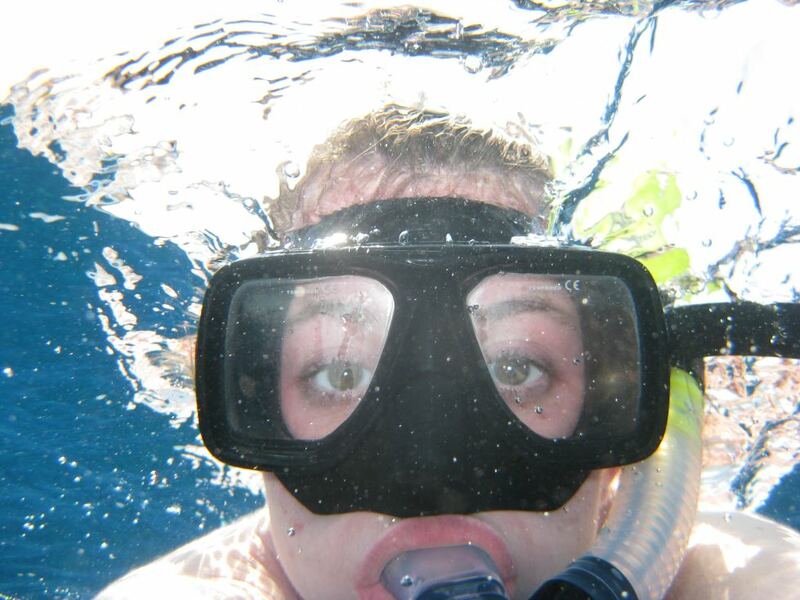 Snorkeling is a fun activity that doesn’t take much skill. If you’ve never snorkeled, you can pick it up quickly. If you are afraid of water, it can be done in fairly shallow regions. If you don’t have your own snorkel gear, you can rent it at most resorts. If you can’t find any place nearby, you can try Snorkel Bob’s . 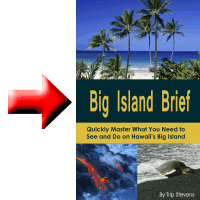 They have two locations on the Big Island: Kohala coast and Kailua-Kona. They have complete packages of snorkel gear, beach chairs, and umbrellas. Even if you haven’t quite decided whether to give snorkeling a try, consider dropping in to Snorkel Bob’s anyway—it’s a unique experience in and of itself. Another option is to buy your own snorkel gear. Early on, my family decided that we were going to visit Hawaii frequently enough that purchasing our own gear made sense from an economic standpoint. But there are other reasons to buy your own, too. Some snorkel rental places don’t worry too much about hygiene, so if you’re worried about germs, the simple peace of mind that comes from having your own equipment makes it well worth the cost. If you do decide to buy, there are plenty of places in Hawaii to get outfitted, but the quality will most likely be lower than if you had shopped around before leaving home. If you’re trying snorkeling for the first time, and aren’t sure you’ll ever do it again, getting inexpensive equipment might be a good way of testing out your enjoyment level. But if you are serious about snorkeling, you should go to a high-end scuba diving shop before your trip and get a decent snorkel and mask. It will be well worth your money. When you do visit the dive shops, make sure and pick up some anti-fog solution. Nothing will ruin your underwater exploration quicker than a fogged-up mask. If you can’t see through your mask, you might as well be sitting on the beach with your eyes closed. Spend a little time learning how best to use the solution. It’s a pretty simple procedure. Put a couple of drops of solution on the inside of your mask, spread it around with your finger to make sure the entire surface is coated, and then quickly rinse the mask out. I say quickly because your goal is to rinse off the extra solution but still leave a residue on the surface, so just swish your mask in the water for a few seconds rather than giving it an intense soaking. As you float motionless in the water watching fish, your back is an excellent target for the sun. While fascinated with the gorgeous floating parade of tropical fish, it is all too easy to lose track of time and not realize how long your skin has been exposed to the sun. So protect yourself. This is an ideal time to wear a UV-protected shirt. Also, apply sunscreen thirty minutes before getting into the water. That time is necessary for the lotion to absorb into your skin. A quick application before you dive in not only won’t protect you, it will also simply rinse right off and become yet another pollutant that the fish must deal with. It is also important to stay hydrated while that sun is beating down on you. And it is easy to underestimate just how dehydrated you are because, after all, you are surrounded by water. So ensure that you drink plenty of water before you settle down in the water to watch the fish. Check your gear before getting into the water. Make sure you have a good fit on your mask. Put it on and inhale through your nose. You shouldn’t be able to breathe in any air. If you can, you have leaks and need to tighten up the strap or get a different mask. If you have thick facial hair that keeps the mask from making an air-tight seal against your face, try a fairly thick coat of Vaseline over your facial hair to make a seal. Get a Hawaii reef fish guide. You can usually pick one up in the local dive shop or download one here. Being able to identify the fish you see makes it a little easier to compare notes with fellow-snorkelers. Make sure you learn to identify the humuhumu-nukunuku-apua´a which is the Hawaiian state fish. Be aware of the dangers of the ocean. It is easy to get into trouble fast in the open ocean. If there is a lifeguard, ask for ocean conditions. I have often seen red flags (no swimming) posted on beaches when, to me, the water looked fine. I don’t question the judgment of the professionals who deal with these conditions day in and day out and neither should you. The Big Island has an overabundance of great snorkeling spots. Here are a few of my favorites. Puako Bay – This is a great place to snorkel when it is calm. I repeat, when it is calm. Monitor the surf conditions often because they can change quickly. At Puako Bay you can see eels, crabs and turtles, and a variety of fish. To get there turn off highway 19 at Puako Beach Drive. From there, there are two popular entry points to the bay. The first is 2.1 miles down the road across from the Church of Ascension. The second is 3 miles down the road at Holoholo Beach Park. 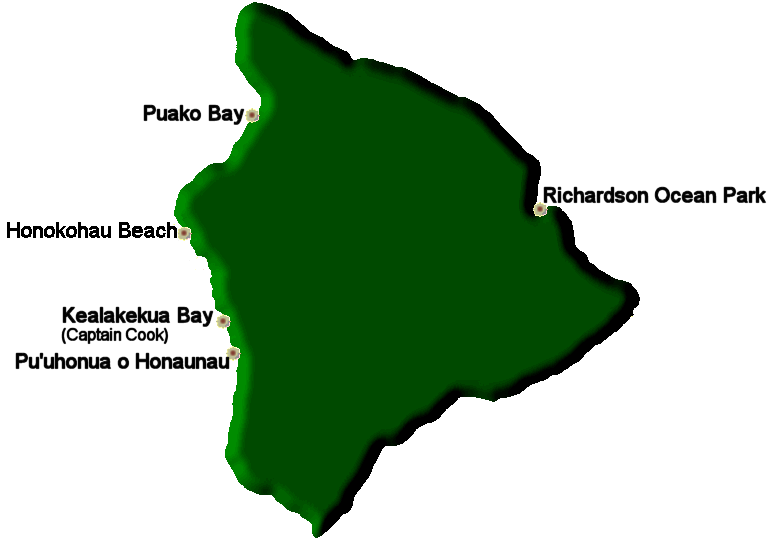 Honokohau Beach – Honokohau Beach is part of the Honokoau National Park. This beach is tucked behind the Honokohau Harbor and a perfect place for snorkelers. Honokohau beach is a long salt-and-pepper beach with ground up coral, lava rock, and seashells. You can see turtles here on the beach and in the water. In the water, you should see wrasses and parrotfish. If you go our far enough, you might see an octopus. To get to Honokahau Beach, drive north of Kailua-Kona on highway 19. Turn left between mile markers 97 and 98 into the north lot of Haonokahau harbor and take the trail to the beach. Continue on just north of Ai’opio Beach. Kealakekua Bay – This is the location of the Captain Cook monument. You can get here via kayak or with a snorkel boat tour. If you get a boat with the right captain, you will hear all kinds of stories of the history behind Cook and that specific bay. There are a variety of fish here and because you arrive via boat you will be in deeper water, so you will see bigger fish and bigger schools of fish than you would see with a shallow shore entry. The snorkeling conditions are fantastic at Captain Cook monument, which makes it a very popular snorkeling site, so be prepared for relatively sizable crowds. For best results, book a morning tour and avoid the chances of cloud accumulation in the afternoon. Also, if you see a spinner dolphin, leave it alone—especially if it appears to be sleeping as startling a sleeping dolphin is extremely stressful for them. Pu’uhonua o Honaunau – Say that ten times fast. Even if you can do it, which would be quite a feat, no doubt you’ll see why this location is also referred to by its shorter name of Honaunau Bay. This is a National Historical Park, also referred to as The City of Refuge. 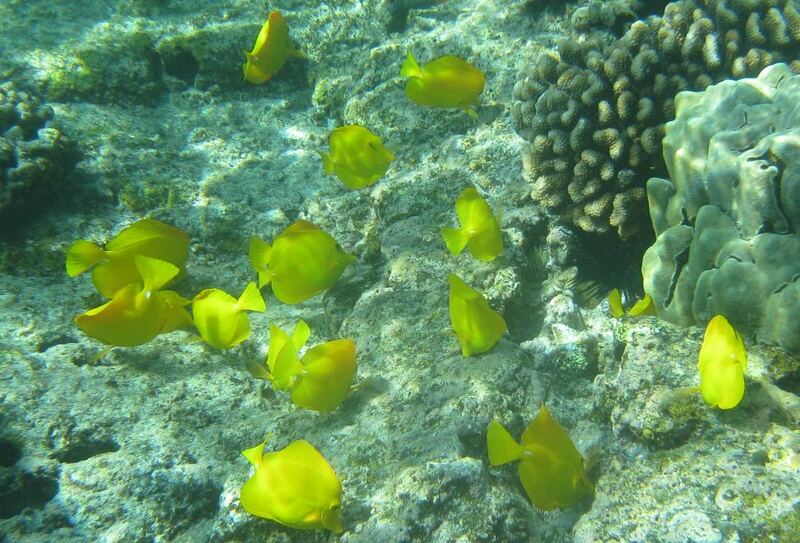 Honaunau is an excellent place to snorkel, for a number of reasons. You’ll find all manner of marine life here, including parrot fish, surgeon fish, tangs, moray eels, turtles and maybe even dolphins. (Be sure and snorkel both the north and south ends of the bay as they are at different depths and attract different types of marine life.) Entry to the water couldn’t be easier; there are lava shelves you can sit on to put on to gear up. Near the shore, the water depth is only about 10 feet deep which means that sunlight can filter through right to the bottom, so that the beautiful gardens of coral that attract all those gorgeous fit can grow. There are a few things to note about Honaunau: there are toilets but no other facilities, so be sure to bring plenty of water. Also, there is no official parking lot and available parking in the surrounding area fills up quickly, so plan your trip for early in the morning. If you block a resident’s driveway, your car is likely to be towed away. And there are no lifeguards. To get there, travel south on highway 11 and turn off onto highway 160 at the Honaunau post office. Drive 3 ½ miles and park on the side of the road and walk to the ocean. Richardson Beach Park – Also called Richardson Ocean Center, this snorkeling spot is next to the Leleiwi Beach Park and is an excellent spot for spotting sea turtles and an occasional dolphin. In general, snorkeling is not too good on the east side of the island but there are a few places like this one that are fairly protected and make for great snorkeling. There are lifeguards here on the weekends when this place gets crazy busy. It is located in Hilo (2349 Kalanianaole Avenue). One quick note of caution about snorkeling: Many guidebooks and websites recommend the Kapoho Tide Pools (the official name is Wai’opae Tidepools Marine Life Conservation District) as a great place to snorkel. However, the truth is that this area has a history of serious bacteria problems, with some of the most serious problems being found at the Champagne ponds. In general, I would advise that you avoid that area for health reasons. But if you would like to do a bit of research and make up your own mind, do a quick internet search on “Kopoho Tide Pools bacteria” and read up on the current state of the bacteria problems.